On the Financial Independence Podcast, I dissect the brains of some of the most well-respected fientists in the field to discover their techniques and strategies for achieving financial independence. Join me for interesting and informative discussions on money, investing, and all things related to early retirement and financial independence! Hey JC, I actually have two really exciting interviews lined up for today so look out for a new episode at the beginning of April! Looking forward to it! Your podcast was the 1st FI podcast I ever subscribed to, and I blazed through all 9 episodes in 3 days. Comments like yours really motivate me to produce more episodes so thanks very much for the kind words! Please post more, I do love listening to them while I work. I have an interview scheduled for Wednesday so hopefully I’ll get another episode out in early August! Great to hear you’re still making more podcasts. I’d assumed you must have stopped. I enjoy the podcast a lot. I’ve went back and listened to many of them 2nd or 3rd times. Please keep making more! That’s very nice to hear, C40, so thanks a lot! Just listened to the first one and I can tell this will definitely be one of my favorites! Keep up the great content and I can’t wait to watch your journey unfold!! I’m glad to see you put out more podcasts. I found your original podcasts a few months ago and they have turned me on to your blog as well as JL Collins and MMM. You have actually inspired me to start my own blog about my journey to early retirement (about 2 years away) and one of my first posts is a review of your site and a few others I’ve found on my own that have been very helpful. I also plan on writing about using your strategies, particularly relating to taxes in future posts. Thanks for all of the effort you put into your blog and podcasts! Hey Chris, that’s cool to hear I introduced you to MMM and JLC because usually it’s the other way around! Congratulations on starting your own blog. I just went over and checked it out and it looks good. I look forward to seeing what you do with it in the months to come! A good friend of mine told me about this podcast and what can I say, I am so glad he did. I already listen to the first 5 episodes in half a day. So much quality content, its fantastic!! I’m glad he did too, Jose! I’m happy to hear you’ve been enjoying the podcast. I plan to increase the posting frequency in the coming months so stay tuned! Thanks for the great content, I have been working my way through your podcasts and articles over the last couple of weeks. A few times you mentioned that you have a savings rate of over 70%. I have been trying to calculate my savings rate, but its a little more complicated that I originally thought (e.g. factoring in 401k, mortgage principal, employee stock purchase program, etc). Do you have a formula or any recommendations on how to calculate savings rate? Hey Ross, glad you’ve been enjoying everything! I just add up all of my investments (including employer 401(k) contributions) and then divide that by my income minus taxes. I don’t tend to factor in mortgage principal but that’s only because I’m too lazy to log in to see how much of my monthly payments are going towards principal vs. interest. I love these podcasts. Sometime you just don’t have time to sit and read but are doing boring work like cleaning. I always try to turn these on, I can’t wait for more! These podcasts are so enjoyable that it has given me some problems. My hobby is keeping my 14 year old diesel Jetta alive by repairing it myself. During two weekends of repairs I played these podcasts back to back and realized that I was so enthralled listening to them that I couldn’t get any work done. Then I took the advice offered in podcast #2 and started reading “How I found freedom in an unfree world”. Now I can’t get anything else done. That book feels like it was written for me! Thank you Mad Fientist for your effort. These podcasts are amazing. Haha, sorry to make you less productive. That’s a great compliment though so thanks very much! Glad to hear you’re enjoying How I Found Freedom in an Unfree World. As I mentioned in my interview with JD Roth, that book changed the way I approach life the same way reading Early Retirement Extreme all those years ago changed the way I approached my finances. Great stuff! I just wrote a post about what I consider the 4 best podcasts for learning about FI/ER and included yours. It was featured today on Rockstar Finance. Hopefully we’ll send you some traffic and new listeners. P.S.–Any new episodes in the pipeline? My only criticism of your podcast is a lack of episodes! Hey, thanks a lot Chris and congratulations on getting picked up on Rockstar Finance! Haha, I am definitely the laziest podcaster ever. I actually do have an interview ready to go (surprisingly) so look out for it within the next week or two. Are you heading to FinCon this year? If so, it’d be great to meet up at some point. Haha, I apologize for being the laziest podcaster ever. I have an interview recorded and edited so I’m going to try to publish it within the next week or two. Stay tuned! Still waiting for the new podcast episode! I check every morning. Update soon! I know, I’m sorry! I’m finally settled in Scotland now so I plan to release an episode early next week! Hopefully this podcast isn’t dead. I found it and blazed through all the episodes in a week. I really love the content and hope you will release more episodes and more frequently. I have learned some life changing stuff, no lie. Thanks! Glad you’ve been enjoying it! Comments like yours motivate me to put out more shows so thanks for the message! Thanks for a great podcast! Hoping for more episodes to come. Trying to arrange two interviews now so hopefully there’ll be another episode soon! Really enjoyed your shows. It was like a “Who’s Who” of the personal finance world, and I got to hear the real life voices of a couple of favorites, as well as learn about some new blogs, books, and sites to check out. I’ll add my comment to those who are sad that you have so few shows, but if it’s because you are living out your plan, then more power to you!! I’ve been strictly audio so far; at least I have all of your blog posts and lab stuff to get through when I have the time. Glad you enjoyed the episodes, Maria! I’m lining up two interviews now so I’ll hopefully get more podcasts out soon. Let me know what you think of the blog posts and FI Lab after you check them out! Yay more podcasts soon! Maybe the Under the Microscope series could be in both Podcast and Blog form? Possibly! I need to get through all the other interviews I have planned first though. So I’m subscribed to your emails, but it had been a while since I clicked a link and actually came to the site. But today, I saw the post about your new website and moseyed on over. I remembered that I had previously commented, so I scrolled on down and ‘Lo and Behold: I commented exactly 2 years ago!! This is a great way to get another view on different people. I love the series and use it in teh car when commuting. I hope to see more of these. I know no one else has bothered you about this on this page and this may come as a surprise, but … I’m almost done getting through your podcast. When they’re gone, who will entertain me while simultaneously educating me about my beautiful future without a job? Like you, I also had a great experience listening to all of the FIentist’s podcast, but also like you my rate-of-listening quickly overtook his rate-of-posting. 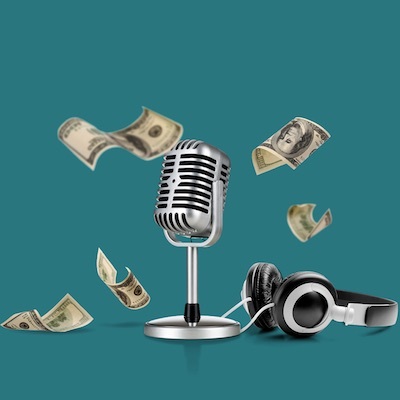 So I’m currently checking out the podast Radical Personal Finance (actually the guy who was in episodes 7 and 8 here) – he has a podcast that he updates a few times a week. I’m not sure how much of it is geared to FI as opposed to general PF topics, but with an output like that, there must be some good nuggets in there. I’ll keep the FIentist in my RSS feed, but his posting history has shown him to be more focused on “quality” than “quantity”, so I wouldn’t keep holding your breath. Wanted to say I’ve really been enjoying the podcast, keep it up! Thanks, Peter! More episodes coming soon! I also listened and studied from the JD Roth and Mr. Money Mustache, look forward to the rest. Thanks for the podcasts. I’ve been listening to a lot of them lately as I have a newborn and pretty much bounce her for 2 hours every night so that my wife can get a head start on sleep. I particularly liked your discussion with Mike from Lacking Ambition. If you need any other ideas, I think it’d be great if you could get Doom from Living a FI or BNL from … Brave New Life. Thanks for the great podcasts! Inspirational, motivating, and informational! Keep them coming! Just found your podcast today and then checked out your blog. Thanks for doing this for people like us. I am 29/F and would love to retire by the time I am 40. My friends think I am psycho. I look forward to following you and using the tools you have provided … then, proving everyone wrong. More! More! I have already listened to all of them at work over the last 2 weeks. Love it. Is there a way to add your ‘catalog’? I’m not sure what is required but I am thinking of something like an RSS feed that could be added to a podcast app. I am trying to subscribe to your podcasts on I-tunes to make it easier to find your podcasts and to of course know when a new podcast is posted. I can’t seem to subscribe as the “subscribe” button on your podcast link isn’t working in i-tunes. I don’t have that issue with any other podcast I’m trying to subscribe to. I love your podcasts. They are awesome! Please continue!! I’ve been a long time fan – for years, really – but I only started listening to your podcasts yesterday. I’m already on Radical Personal Finance #1. It’s addicting! Keep it up! Just wanted to drop by and say a big THANKS for the AMAZING job that you’re doing. I just recently discovered your blog about two weeks ago and until then I had no idea what I was doing with my financial life. You’ve given me the necessary tools to secure a bright financial future. A million thanks again to you and all the smart people you have on your podcasts. Thank you for all the work you do with all the boring stuff and with the podcast, not sure if you did one for high earners without access to 401k plans, how to best grow that egg on tax-sheltered accounts. Thanks to your pod case I look forward to road trips now, I load the episodes on my flash drive and hit the road. Lots of good stuff on each one. I have my favorite but I enjoy them call. Keep them coming. I think I should take a drive to California i’m in South Florida. I have just binge listened to all 32 podcasts in last two weeks. Awesome interviews and content. I’m 53 and when I do the math, I could stop working. More importantly, I’m passing on my enthusiasm for your podcasts and blog links to other FI’ers you’ve interviewed to my college-aged daughters so they can start their post college lives on an FI path. Keep up the great work Brandon. These podcast are great, I started with your first one, and cannot stop listening to them. I am French, living in France. A few topic are more targeted to the US, but most of it work for all. This is all common sense, but it is very good to have refresher from time to time. Confused, I try to live a frugal non consumerism life, but how does your last quest. I have loved all your podcasts and was excited to see a new one ready for me today. I am much older in my mid 40’s and am so impressed by your maturity to have this mindset at such a young age. I wish i had awakened earlier. I will be encouraging my two children to consider striving for FI in their futures. I have one very interested so far. I am encouraged by you and your guests ideas and the podcast has lead me to your many guests inspirational web pages. Thank you for all this great information! I’ve always been frugal but just recently stumbled upon the idea of FI. I’m in my 50’s but better late than never! Can you please note the date of the podcast when you post a podcast? Thank you. I never miss an episode! Cheers to the FI life! Keep up the good work. Brandon – just wanted to say thanks for making these podcasts, they’ve been indispensable roadtrip / commuting listening for me over the past year. I appreciate the deep dive you do with folks, getting into the nitty gritty details of the areas in which they’re experts. A few favorites were the Vicki Robin and Doug Nordman interviews, since they had points of view and perspectives much different from the typical millenials (including myself) forged in the image of yourself and MMM. I know it’s a ton of work making these so just wanted to let you know you’re doing a badass job and we anonymous people out in the internet ether appreciate all you do. Thanks for doing these! I enjoy the varied perspectives that you bring to your podcast and the breadth of issues that you cover with excellence and ingenuity. The podcasts have really improved my desire to do yard work, as I now have a great podcast to listen an to. Great work! Podcasts are very interesting and also fun. I’m here listening from Buenos Aires, Argentina. Thank you for sharing your time and insight. Loved the Michael Kitces podcast. Listening to the Michael Kitces podcast (great!) and heard your speal about the credit card search tool on your website. My very frugal sister who has a credit rating in the 800’s is in the marked for a second credit card, so I took a look – she is looking for a cash back card only (no interest in travel miles). Wondering if you wold consider addition a cash back filter to your site? Thank you for doing this. Your podcasts have been a major source of input for building my own investment and reaching-FI strategy. Keep up the awesome work! How’s life going in Scotland? Love your style and material! I’ve been soaking all this up and optimizing to get to FI. I’m hooked on the FIRE podcasts, yours being #1 on my list. What do we need to do to get you back on the 2 podcasts per month schedule? Thank You for making a difference in this community!!! Okay, we will accept one a month! How’s that. Chomping at the bit for your next podcast! Hey bud, missing your podcast, somehow it seems to centre me as I go down this path. It feels like it’s been months since we’ve heard anything. Are things ok? Loved your Fincon podcast, funny as hell! Wish someone had done this for me when I was in my 30s… But I figure 60s is not too late! Hi thanks for these amazing podcasts! I love them! Is there a way to search the transcripts of all the podcasts? I see that we have each transcript but is there a way to search the entire database? Thank you so much for doing great podcasts! I am from Taiwan, there is no ppl doing podcasts here and the money education has never been taught by my parents or schools. I listened to 5 podcasts so far and each replayed for 3-5 times. I did an excel file to take notes and all the resources mentioned. As I listened I found Americans are generally very rich when speaking of definite currency income value, there is gap in the first world countries and the rest. Anyway, you’ve broadened my visions. Thank you so much I deeply appreciate it. I want to start by saying I really enjoyed listening to your podcasts. I have a question for you. I don’t recall hearing anything about a 529 plan. What are your thoughts on using it as a means for saving for your child’s education or even furthering your own education? Is it similar to an HSA in that you can pay yourself back at any time provided the expenses are documented? Any chance the podcasts can be made available in other streaming services? Spotify, Google Music, Stitcher, etc. Keep up the great interviews! I listen to it through the google podcast app so it’s probably available through multiple platforms. dumb question but Brandon mentioned a pdf his brother put together on the one piece of advice section from all his guests? Where do you get that from? Your podcast is amazing and I’ve grown to love it so quickly! I really look forward to hearing more from you soon. Thank you! Listening to your podcast is my early morning is my morning meditation. Thanks so much. I’m wondering what you suggest I save in an easily accessible emergency fund before i begin using my savings for investment purposes like index funds? 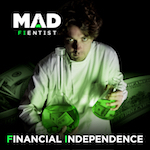 Dear Mad Fientist, your podcast is the one that I am most excited about when a new episode is released. While it’s not specifically a personal finance topic, I was wondering if you might be willing to take a look at my upcoming how-to book on the art of capturing a person’s tacit knowledge into what I call a legacy video. Maybe I could mail you out an advanced sample copy? (http://foreverlegacybook.com) I was thinking the book might be of interest to your listeners who have achieved FI and are seeking out creative new ways to infuse their life with purpose, or for the people still on the path, it could help them focus on giving the gift of their attention and capturing experiences vs. spending money on frivolous material possessions that will only postpone them reaching FI. And because I remember you saying once that you’re also an INTJ like myself, I thought the concept might resonate with you. Keep up the good work! Mad Fientist, i can not name any other source which inspired me more. Thank you for a fresh introspective look on myself and the way i look at things surrounding me. Please keep recording them.